The club has four artificial grass courts and three hard courts, all of which are floodlit. We also have several mini red and mini orange courts for the youngsters. There are NO charges for members to use the courts, and tennis balls are provided free to members as part of the annual subscription. Floodlights are operated by pre-payment cards with lights costing £6 per hour. During club social tennis in the winter, floodlighting costs a nominal £1 per session. The club runs an extensive coaching programme for youngsters and adults – with sessions to suit different ages and abilities available on most days. We organise a range of tennis and social events as well. Being a very friendly club, the social aspects are just as important as the sporting achievement. We hold a great variety of social events throughout the year, including wine tasting, quiz nights, family discos as well as more formal dinners. 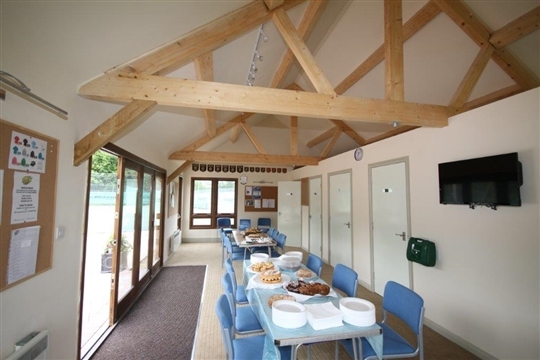 The club has a new courtside pavilion which provides toilet and changing facilities as well as a kitchen. This has been an important addition to support parents watching their children during coaching sessions. It provides a base to help families enjoy tennis, do school homework and have their evening meal at the same time, particularly if they are managing coaching for more than one child at a time. Showers and a licenced bar are available in the main clubhouse. Guests are always welcome. There is a great selection of alcoholic drinks on offer, including draft beer and a wide selection of wines and spirits. Non-alcoholic drinks as well as tea coffee and hot chocolate are readily available. There is a practice wall and an automatic ball “firing” machine – both of which allow you to practice on your own if that is your preference.